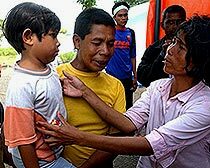 A 7-year-old girl who was swept away by the devastating tsunami in Indonesia was brought back to her parents on January 19, 2005. She had been missing for over three weeks. Hernini and her husband, Amiruddin, pulled themselves on the roof of their home as the water flooded their neighborhood. But a utility pole fell and Putri, the 7-year-old girl, became separated from them. As soon as the waters receded, family and friends began to search for the young girl, but they could not find her anywhere – not even among the corpses that lined the streets. So they believed that she was alive…somewhere. Amiruddin and Hernini began posting signs and handing out “missing” fliers. They followed every lead that they received. They would hear that a young girl was found somewhere, run to the destination, and then find out that it was not Putri. Over and over, the same scenario played itself out. Amiruddin and Hernini began going to all of the tsunami refugee camps, desperately searching for their child. At one of the largest camps, know as TVRI, Amiruddin left information about his daughter, prayed, and left. At a small refugee camp in a farmhouse, a refugee who had previously been at TVRI saw Putri and realized that she was the girl that Amiruddin was looking for. On January 19th, Amiruddin’s name was called on the TVRI intercom. At first he thought that a friend was looking for him; but he soon realized that his prayers had been answered when Putri ran into his arms. Soon, many other family members and friends gathered around, screaming and crying in joy. “I am so happy. This is like medicine for my heart,” said Hernini. “Yesterday, I was crying and felt like nothing. Today, I’ve got my daughter."